The Proto-Bulgarians north of the Black Sea and the Sea of Azov in the VIII-IX cc. The continuous excavations in the lands to the north of the Black Sea and the Sea of Azov reveal that during the VIII-IX cc. they were inhabited by numerous population, who had created the so called Saltovo-Majack culture. Its bearers had been mainly Proto-Bulgarians and Alans . Particularly important is the fact that while the nomadic Proto-Bulgarians had left virtually no traces prior to the VIII c., in the middle of the VIII c. there appeared many permanent settlements and fortified sites . The appearance and development of the Saltovo-Majack culture were stimulated by the settlement down of the Alans and the Proto-Bulgarians and by the internal stabilization of the Khazar Khaganate. The highest concentration of Saltovo-Majack finds occurs in the lands along the rivers Don and Severski Doneck, and they show many similarities with the culture of Danube Bulgaria. It is generally assumed that the Alans of the upper courses of Don and Severski Doneck were immigrants from the Fore-Caucasus, which they were forced to leave after the Arabian expansion. Immediately after reaching their new lands they settled down. This is an evidence that they were sedentary people even before the migration. It seems that some Alans-nomads, who before that lived the same nomadic life as the Proto-Bulgarians of the north Black Sea steppes, also settled down. This increased significantly the number of settled Alans. More complicated is the question about the origin of the Proto-Bulgarians, who occupied the lands to the south of the forest-steppe belt, along the lower Don and the middle and the lower courses of Severski Doneck. Up to now there are no reliable data about any Proto-Bulgarian migration from that region caused by the Khazarian expansion other than the "movement" of a part of the Kotrags. More seriously was affected the population of the steppe belt along the left bank of lower and middle Dnepr, as evidenced by the "Pereschepino" type finds. Recently some scholars proposed that the Proto-Bulgarian population of lower Don and middle Doneck appeared there only in mid-VIII c., after the Khazaro-Arabian wars. According to them great masses of Proto-Bulgarians left the Caspian steppes and the foothills of Fore-Caucasus and migrated in north-west direction . There is no doubt that the Arab campaigns cause significant displacements among the north Caucasian peoples. We mentioned the Alans already. It is quite possible that the wide steppes north of the Azov and of Crimea had accommodated some immigrants from the eastern Fore-Caucasus, but their numbers could not be great and they were quickly assimilated by the older Proto-Bulgarian populations there. Evenmore, it is assumed that the central Fore-Caucasus was occupied by immigrants from the eastern Fore-Caucasus. This would reduce further the possible influx of Proto-Bulgarians to lands along Don and Doneck. It is indicative, that necropolises of northern orientation, which are characteristic to the east of Don and for Northern Dagestan, do not appear in the lands west of Don. But they are found on the left bank of Don - in Artjuganovo, Sarkel and Semikarakorskoe gorodishte. These necropolises might belong to immigrants from Northern Dagestan, as evident by the vine-growing developed near the right-bank Cimljanskoe gorodishte. The investigations of Pletnjova, complemented by several later works allow the reconstruction of the process by which the former nomads-Proto-Bulgarians were transformed into settled farmers, craftsmen and builder, who had created several impressive monuments. It was already mentioned earlier that the earliest Proto-Bulgarians archaeological finds from lower Don are the extensive collective nomadic camps (kureni). Fragments of Crimean and Byzantine amphorae, found there are dated from the VII and even VI c. Similar is the picture from the middle course of Severski Doneck. Remains of extensive temporary nomadic camps are found in the upper courses of its small tributaries. The finds are very scarce - mainly hand-made pottery and imported amphorae, which points out that these camps had been visited only episodically . Almost simultaneously another type of temporary camps appeared - camps which were situated in the protected against the cold steppe winds valleys of the rivers. Here the finds are 2-3 times more numerous and the share of wheel-made pottery is increased. Most probably the latter camps served as a winter shelters for the nomads. During the next phase of reclaiming the land the stock-breeders founded small permanent settlements along the middle and upper courses of the small tributaries. First there appeared small temporary settlements, which were located at non-inundated terraces near the river banks. They already had clear cultural horizons, up to 0.3-0.5 m thick, and they were inhabited for much longer. The excavations at Podgaevka and Novokilimarevka show that these temporary settlements consisted of 8-10 houses, built in semicircle and forming an inner yard. The wheel-made pottery predominates. Such small camps (auli) belonged to less numerous semi-nomadic groups, created after the disintegration of the tribal structures (kureni). The temporary settlements, which were suitable for settled life, developed into permanent ones. The latter were fundamentally different both in topography and in structure. While the temporary ones occupied the upper valleys' bottoms with abundant grazing grounds around them, the permanent settlements were situated as a rule on the high right banks of the middle and lower courses of the rivers, suitable for agriculture. In contrast to the temporary ones, they have distinctive cultural layers containing numerous artefacts. The pottery is almost exclusively wheel-made, there are also found millstones, sickles, scythes, axes, ploughshares, etc. The light transportable jurts were replaces by circular or close to circular dwellings, some of them dug in 0.4-0.5 m up to 1.0-1.5 m into the ground, thus transformed into semi-dug-outs. The settling down of the Bulgaro-Alanian population in mid-VIII c. led also to the appearance of fortified strong-holds. The earliest ones were situated on naturally protected promontories along the river-banks, they were surrounded by earthen ramparts and encompassed relatively large areas - 40-70 decares. They were permanently occupied. Another type fortified settlement were protected by stone walls (up to 5 metres thick), but the area encompassed was much smaller. They also occupied promontories. Often (in 5 out of 12 gorodishta) the inner most inaccessible part - the citadel, was additionally protected by another stone wall. Two of the these gorodishta - the Majackoe and the Right-bank Cimljanskoe are very important for the study of the Saltovo-Majack and the Old Bulgarian culture. The Right-bank Cimljanskoe gorodishte (see Map) is some 250 km to the north-east of the mouth of Don. The fortress occupies a triangular promontory with steep slopes and connected by a very narrow isthmus to the main plateau. Scheme of the Right-bank Simljanskoe gorodishte (accorfding to Pletnjova). 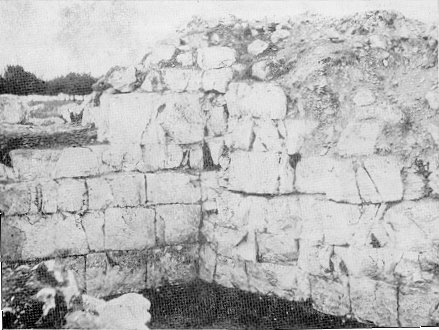 The 4 m thick stone wall consist of an inner and outer facings, built of regular white ashlar blocks (dimensions 0.6 x 0.3 x 0.3 m), the space in between was filled with smaller stones and pebble. One row of ashlars was laid breadthwise, the next row - lengthwise, etc. The high of the walls was 4 metres, and there were 5 towers - two of them guarding the isthmus and other two - above the river Don. The inner space was inhabited, but no massive building are found. The dwellings were light jurts or semi-dug-outs. One jurts however stands out with its dimensions - 6.5x5 m. It has three rooms, interpreted by Pletnjova as a male and female part and a linking central room, and most probably it belonged to the local feudal, the ruler of the fortress. A suitable building material is not found locally, the nearest quarries which could provide the necessary building material are some 100 km higher along Don. The white fortresses high on the steep hill must have been an impressive sight. The exavations yielded abundant iron agricultural tools - sickles of different types, light and heavy ploughshares, scythes, etc. Very interesting are and iron vine sickles. This find in a fortress which is in the centre of one of the most important vine-growing regions in Southern Russia speaks about the early origin of the vine-growing in this region. The inhabitants abandoned the fortress fleeing from some enemy. They buried some of their possession never to return afterwards. Today the excavations unearth these hidden 'treasures', the agricultural, fisherman's and other tools characterize the occupation of the inhabitants. Many are items of parts of the military equipment - iron arrow-heads and spare heads, reins stirrups, etc. One 'treasure' consists of part of the blacksmith's (an anvil, pliers, chisels, files), the carpenter's (axes, saws, various chisels) and goldsmith's (a smaller anvil, nippers, small hammers) equipment. The pottery is representative for the Saltovo-Majack culture, characteristic are the numerous cauldrons with inner lugs. The fortress was built during the final quarter of the VIII-th c. Notwithstanding its defences and protected environment, it was taken by assault and destroyed by an enemy, who did not spare the population, mostly women and children. Beneath the fire-burned walls of the dwellings at many places were discovered skeletons. The end of the Right-bank Cimljanskoe gorodishte is dated by the find of some 50 Sassanid and Arab coins from the first quarter of the IX-th c. Research showed that the other settlements the vicinity, although far less protected, were not destroyed which excludes an external enemy. Pletnjova proposed that the right-bank Cimpljanskoe gorodishte was destroyed by the ruler of the neighbouring Khazar fortress of Sarkel, who would not accept an independent Proto-Bulgarian ruler in his region  Artamonov, however, does not share her opinion. According to him the first quarter of the IX-th c. evidenced the adoption of Judaism by the Khazars, which led to prolonged internecine wars. The Cimljan ruler obviously took the side of the Khazar enemies and was punished accordingly. After the destruction of the right-bank Cimljanskoe gorodishte the Khazars built another fortress - Sarkel, which became their stronghold in the region. One part of the population returned to Cimljan after the debacle, however the fortress lost its military importance and was transformed into a casual village of fishermen. It was taken and destroyed again by the Pechenegs in the end of the IX-th or in the beginning of the X-th c.
The other ruins of particular interest, the Majackoe gorodishte (see Map) is situated at the northern edge of the steppe, near the lesso-steppe belt and it is the northernmost example of the Saltovo-Majack culture. Scheme of the Majackoe gorodishte. the same as in the Right-bank Cimljanskoe gorodishte). As in the other two cases the walls had no foundations, they were laid directly on the levelled ground. The blocks formed two walls, the inner space being filled with not so regular blocks and pebble. The total thickness of the walls was 6 m, somewhere up to 7 m, and the height - 6.0-6.5 m. The entrance was of the NW wall, guarded by a massive rectangular tower. An inner 42 m x 27 m rectangular fortification, contiguous to the SW wall, served as a residence for the local ruler. Part of the built of quadras wall of the Majackoe gorodishte. Majackoe gorodishte. Part of the inner side of the wall with the typical ashlar blocks. To the east of the ruins there is a large catacomb necropolis. The characteristics of the burials (few artefacts, the predominance of single burials, some differences in the structure of the dromos, etc.) link them with the Proto-Bulgarian pit burials and, especially, with the Chirjurt catacombs. Another peculiarity are the numerous signs and graffiti chiselled or scratched on the limestone quadras of the fortification. Besides the drawings of horses, donkeys, deer and other animals; scenes of a fight between a horseman and a footman, etc.) there are many symbolic signs - swastikas, pentagrams, crosses, etc. as well as runic inscriptions. The drawings, the signs and the runic inscriptions are absolutely similar to those from Bulgaria and from the treasure from Nagy Saint Miklos. All this evidence made Pletnjova to attribute the Majack gorodishte to the typical Proto-Bulgarian monuments. Plausible also looks her hypothesis that Majack was built by immigrants from Cimljanskoe, who took refuge in these northern lands among the friendly Alans after their own town was destroyed by the Khazars. now under the waters of the Cimljanskij reservoir, was built some 15 km to the east of the Right-bank Cimljanskoe gorodishte. The excavations  revealed that the Proto-Bulgarians were the main inhabitants of Sarkel during the Khazar period - the drawings, signs and the runes in Majack and Sarkel are very close, they also have counterparts on the quadras and bricks from the first Bulgarian capital of Pliska. As in Danube Bulgaria many if the signs were scratched on the walls and handles of the pottery, especially amphorae. The very name of Sarkel ("White house, White fortress") does not fit to its red wall, built of bricks. Artamonov is very convincing in saying that Sarkel, built after the destruction of the white fortress (Righ-bank Cimljanskoe, which was probably called 'White town, White fortress') on the other bank of the river, took the name of the opponent. The numerous runes and symbolic signs on the bricks of Sarkel are very important having in mind the scarcity of such material in Right-bank Cimljanskoe. The latter was virtually destroyed in 1744, when its quadras were re-used by the military. Immigrants from Dagestan had obviously influenced the pottery production in the Lower Don region - the structure of the local pottery kilns is identical to that from Andrejaluskoe gorodishte. However, it was the traditions of the Alans who had the greatest influenced over the development of the Proto-Bulgarian pottery. The two built of white quadras fortresses along Don are distinctively different from the stone fortifications of the Alans as well as from the Khazar centre of Sarkel. They are unequivocally related to the Humarin ruins on Kuban and a number of fortifications in Danube Bulgaria. It was mentioned already that the Proto-Bulgarians believed that under certain conditions a man could be possessed by an evil spirit. Consecutively, there was number of "safeguarding measures" (as evident in the burial rites). In similar terms was also explained the unnatural behaviour of mentally ill people and epileptics. In order to "drive away" the evil spirit, besides the ordinary repertoire of incantations and religious-magical procedures, there were another, more radical measures, performed by a specialized category of medicine-men. They performed trepanations of the scull, usually near the saggital suture. A significant number of such trepanations, sometimes several on one scull, is attested among the Proto-Bulgarians of this group and especially among the Volga Bulgars  But the Proto-Bulgarians from Severskij Doneck went further - in the necropolis of Zholtoe, near Voroshilovgrad, were discovered two sculls with not symbolic, but medical trepanation: the sculls were bored by a silver plate, in one case the patient had a haemorrhage of the brain and in the other - a brain tumour . I.I. Ljapushkin. Pamjatniki saltovo-majackoj kul'turii v bassejne r. Dona, s. 85-150. S.A. Pletnjova. Drevnite bylgari ..., s. 12, 16. S.A. Krasil'nikov. Vozniknovenie osedlosti u prabolgar Srednedonech'ja. - Sovetskaja Arheologija, 1981, No 4, s. 110-111. S.A. Pletnjova, Ot kochevij k gorodam ..., s. 39. The Proto-Bulgarian character of the inhabitants of the fortress is confirmed by the anthopological material from the burned dwellings - it belonged to brachyochranic europeids with slight Mongoloid features - the characterstic features of the Zlivka Proto-Buglarians. M.I. Artamonov, Istorija khazar, s. 313-316; V.V. Ginsburg. Antropologicheskij sostav naselenija Sarkela - Beloj vezhi i ego proizhozhdenie. MIA, 109, 1963, s. 260 sl. P. Boev. Simvolichni trepanacii ot SSSR. - IIM, XI, 1965, s. 133 sl. K.I. Krasil'nikov, A.A. Ruzhenko. Pogrebenie hirurga na drevne bolgarskom mogil'nike u s. Zheltoe. - SA, 1981, No 2, s. 284-288; G. markov, D.Il. Dimitrov. Simvolichni i lechebni trepanacii u prabylgarite. - Jubilejna nauchna sessija na VMI - Varna (XI.1981 g.). Varna, 1982, s. 199-202.